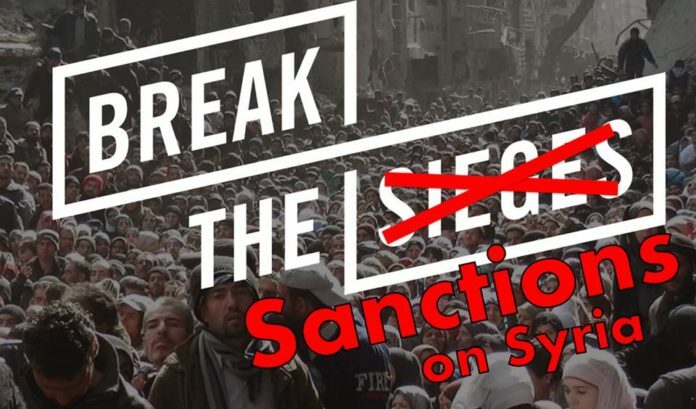 Syrian religious leaders representing the republic’s three largest churches (Greek Orthodox, Melkite Catholic, and Syrian Orthodox) recently issued a statement calling for an end to the economic sanctions on Syria, which they blamed for impoverishing the Syrian people. That the west predictably ignored these calls is symptomatic of their abject refusal to address the most important truth about the war, which is that the militias waging war on the Syrian state are infinitely more dependent on an external predatory alliance of nations for constant flows of foreign mercenaries, funding, weapons, training, and even direct assistance on the battlefield than they are on any internal discontent with the Syrian government. Those predatory nations include NATO states such as the United States, Britain, France and Turkey, and their regional allies, including Saudi Arabia, Qatar, Jordan and Israel, as well as other governments that fall in the ‘western sphere’ such as Canada and Australia, both of whom have co-signed the objectives of the proxy-war on Syria. Those who live in these predatory nations, especially so-called ‘westerners’, are ironically encouraged to imagine themselves as the probable saviours of those living under siege IN Syria while being mostly oblivious to the fact that their governments have imposed an economic siege ON Syria. Lifting the economic siege ON Syria would be a lot easier, but it would require westerners to come to terms with the reality that their governments are the problem, not the solution. The notion that the sanctions on Syria are ‘targeted’ in the sense that they only affect ‘regime officials’ is the oldest lie used to justify economic aggression – this same lie was used to justify the sanctions on Iraq after the first gulf war. When Madeleine Albright (then US Ambassador to the UN) was asked whether she believed the colossal death-toll of Iraqi children caused by these sanctions was worth it, she famously replied in the affirmative, saying ‘we think the price is worth it’. In terms of achieving US foreign policy objectives she was correct since healthy children are potential Iraqi soldiers capable of defending their country against US aggression, so it’s much more effective to bring the country to its knees first, even if it means killing children. Today Syria is being ‘softened up’ by sanctions that are just as ‘comprehensive’ as those imposed on Iraq. Visa, Mastercard and Paypal all suspended services to Syria in August 2011 after the announcement of Executive Order 13582 by the US Treasury, prohibiting US persons (corporate entities included) from providing any services to Syria, which is a severe blow given that global financial transactions are dominated not just by these corporations but by corporations based in countries that impose financial sanctions on Syria in general. This means that even people living in countries that never went along with the sanctions are unable to send money to Syria using these three services on the grounds that these three corporations are technically US persons and thus subject to US laws. It also blocks the ability of many among the Syrian diaspora to send remittances back to their families, which is particularly cruel given that remittances are one source of revenue that would logically increase during a war, due to greater efforts made by the diaspora to support their relatives back home, and also because of the money that Syrians made refugees by the war would wish to send back, assuming they find sources of income abroad. Of the $1.6b (current USD) that Syria earned in remittances in 2010 (which is the last year for which accurate World Bank figures are publicly available), 75% came from countries that now impose financial sanctions on Syria (see Figure 1). In the case of the GCC states, which contributed 37% of Syria’s pre-war remittance revenues, the move to block remittances was a defensive move by Damascus itself because of the colossal financial support that Saudi Arabia and Qatar in particular have offered the Islamist proxies. As for the other 38% (which in addition to the previous 37% equals the 75% figure quoted earlier), this is made up of Jordan (16%), Turkey (14%), the EU (5%) and the Anglosphere bloc of the US, Canada, Australia and the UK (3%), all of which impose financial sanctions to varying degrees. While it’s unclear what Syria’s remittance earnings actually are at present (especially given the cash-in-hand transfers that go unaccounted for and other informal methods) there’s no doubt that Germany in particular will host a sizable Syrian diaspora community in the near future and therefore may feel compelled to accommodate growing demands for financial sanctions to be lifted. The exhaustive nature of the sanctions helps explain the pattern of corporations ‘over-complying’, that is refusing to do business with Syrian persons or entities altogether to avoid heavy penalties. In March 2015 Paypal was ordered to pay $7.7m to the US Treasury for facilitating transactions worth a measly $44,000 between Cuba, Sudan and Iran that were in violations of US sanctions – that’s a $7.7m penalty for transferring up to $44,000, of which Paypal would have early taken only a small fraction in operating revenues. With penalties that are orders of magnitude higher than the amounts violating the sanctions, why wouldn’t Paypal (and others) ‘over-comply’ with the sanctions just to play it safe? A currency depreciates when a country imports more than it exports, which is why the rising demand for heating fuels to keep Syrians warm in the coming winter months predictably led to Syria’s Central Bank announcing a 6% devaluation of the Syrian pound, which now officially trades at 517.4 against the US dollar. Although Syria was an importer of petroleum products even prior to the conflict, this import bill was at least offset by export earnings from the sale of crude oil. In the eleven years prior to the conflict (from 2000 to 2010 inclusively) 53.1% of Syria’s total export earnings of $81.9b (current USD) came from the sale of crude oil, however this percentage fell dramatically to around the 6.5% mark from 2012 onwards (see Figure 2). The reason? In September 2011 the EU imposed sanctions which banned the importation of Syrian oil – a major blow given that in 2010 (the year prior to the conflict) the EU bloc was Syria’s single largest export-destination, earning 41.4% of total export revenues (exports in 2010 were $12.2b in current USD. These sanctions were later lifted in May 2013, but only after the al Qaeda affiliate Jabhat al Nusra (now known as Jabhat Fateh al Sham) had seized control of Syria’s oil fields in the north-east of the country. A month later in April 2013 a split within the ranks of al Nusra produced ISIS which has been selling stolen Syrian ever since, largely thanks to the EU’s willingness to be their customers. At the time, the EU’s decision (to begin funding al Qaeda via the theft of Syria’s natural resources) was promoted by the Guardian as a way ‘to help the moderate opposition’ despite their report also acknowledging that ‘al-Qaida and other extreme Islamist groups control the majority of the oil wells in Deir Ezzor province’. To the extent that ISIS has developed a Frankenstein-like independence from its original backers, it’s because they can sell this stolen oil, meaning that they don’t rely on their sponsors as much as their so-called ‘moderate’ rivals. Should oil prices rise again to above $100/barrel thereby making it viable for Syria to resume oil exports (that is if Saudi Arabia stops driving down prices) Europe will have to make a choice – either lift the sanctions and buy from the government, or continue funding ISIS. The sanctions, by helping to demolish the value of the Syrian pound by a factor of twelve (it’s pre-war value was 45 pounds per USD in 2010), has raised the price of imports by roughly the same factor, meaning that sanctions needn’t even formally prohibit the sale of medicines to Syria to make them unaffordable and scarce. Maintaining the perception in the west that President Assad is almost solely to blame for the deterioration in public health is perhaps why the perspectives of Syrian doctors, who are in the best position to comment on the relationship between sanctions and healthcare, are routinely ignored. Dr. Nabil Antaki, a medical practitioner who works in the government-held western Aleppo, had this to say about the sanctions, “we are disgusted by these sanctions because these sanctions and these embargoes have not been implemented against the Syrian government but against the Syrian people, all the Syrian people”. Just as the sanctions on Iraq resulted in the deterioration of the water treatment systems by blocking the importation of the spare parts needed to fix them, Syria’s medical staff are experiencing similar difficulties when it comes to fixing their equipment. Describing the bureaucratic hurdles in sourcing parts, “I wanted to replace one part of a piece of medical equipment. Normally this would take one week, it took a year and a half to get hold of the part because we couldn’t import it from Japan as it was a multi-national company”, Dr Antaki said. Another doctor from Aleppo Dr. Tony Sayegh also blames sanctions, “something that makes life even more tough are the economic sanctions that the US and EU have imposed on Syria. The sanctions do not hit the government but the people”. When I visited Syria in July 2015 as part of a delegation we met with Syria’s Health Minister Dr. Nizar Yazigi who pointed out that of the 70 pharmaceutical factories Syria once had, now only 20 remain. These factories are what enabled Syria to achieve remarkable levels of self-sufficiency in the production of medicines prior to the war. According to the Syrian Economic Forum (which is critical of the government), 91% of the medicines consumed in Syria a year prior to the war (2010) were produced domestically. The decimation of Syrian industrial capacity is not just a symptom of the generally destructive nature of war, but also because proxy-armies have looted industrial areas. This is why after Sheikh Najjar’s industrial complex was taken back by the Syrian government in July 2014 (from Al Nusra, Ahrar al Sham and other smaller FSA militias) Aleppo’s industrialists, represented by the ‘Aleppo Chamber of Industry and Commerce’, began proceedings to take the Turkish government to The Hague (International Court of Justice) for their complicity in the plundering of ‘more than 300 factories’ including those used to produce medicines. The combined strategy of plundering Syria’s productive capacity and then imposing sanctions on Syria to hinder the process of reconstruction looks like an attempt to shift the dependence of the Syrian public away from the government and towards to the forces seeking to topple the government. This would also explain why the emphasis in the west is on directing charity towards organisations based outside Syria’s borders mainly in neighbouring countries, like Turkey, Lebanon or Jordan, on the pretext that it’s needed to help Syrian refugees, who, ironically, left Syria due to the policies of these countries (except Lebanon) in the first place. By contrast, charities that operate in government-held Syria (where the vast majority of Syrians live), such as the Syrian Trust for Development, are often starved of donations from wealthier nations because those same nations either enforce the sanctions, or have online payment systems that are dominated by corporations that enforce the sanctions. Other ‘charities’ however, like the Islamic Humanitarian Relief Foundation based in Turkey and the Qatari Red Crescent, that have been caught smuggling weapons to the proxy-armies inside Syria, experience no such online blockades. If the key concern was Syrian welfare then it would be far more effective to stop strangling the healthcare system that already exist, which Syrians spent decades building, and which serves the vast majority of the Syrian public. To those unfamiliar with the region, Syria today epitomises nothing but war, which is why it may surprise them to know that prior to the conflict, Syria was actually something of a post-colonial success story, a feat largely achieved by a decades-long legacy of free healthcare, free education and a strong public sector. Crunching the numbers (available from the World Bank and IMF databanks) gives one the impression that Syria ‘punched above its weight’ in terms of human development. In the year prior to the war (2010), countries that were wealthier than Syria did only marginally better in terms of life expectancy on average, while countries with lower life expectancies than Syria did so on much higher incomes on average (weighted by population). If China is excluded from the sample of nations wealthier than Syria, and if Peru is included to keep the sample at twenty nations, then Syria does better on life expectancy by 2.3 years than the revised sample average of 70 (see Figure 3). As for the sample of nations with lower life expectancies than Syria (again, a sample of twenty nations) their average income works out at $11,385 (current international dollars) which is $5,010 higher than Syria – in other words, Syria did more for its people relative to its income than nations in the same proverbial ballpark (see Figure 4). Punching above its weight, Syria’s achievements on the eve of the war are only diminished by the inclusion of China – nothing to be ashamed of given China’s remarkable achievements in human development. To those living in the so-called ‘west’, regardless of what you may think of the manner in which the Syrian government conducts itself militarily, this is not something you have much control over, however you do have some agency in opposing your own government’s policies that are fuelling this war. Whether those policies include arming the death-squads that the Syrian government is predictably resisting, or imposing the cruel sanctions that are killing Syrians quietly, either through artificially inflated food prices and medicine shortages or by preventing them from receiving remittances from abroad, these are the actions you have some agency to oppose. Westerners, if you want to ‘break the sieges’ (a reference to the PR slogan promoted by the ‘moderate’ mercenaries who for years have demanded NATO intervention on their behalf) you should start with the economic sieges imposed by YOUR governments against Syria.